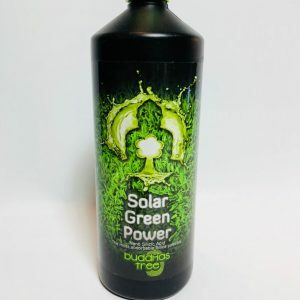 Buddhas tree is the only PK 9-18 soluble solution currently available on the market, created in the UK by a company who have one of the top four chemists in the world working with them who formulates fertilisers for many of the worlds record breaking food crop producers. They have produced this formula that promises to increase yield by at least 40%. 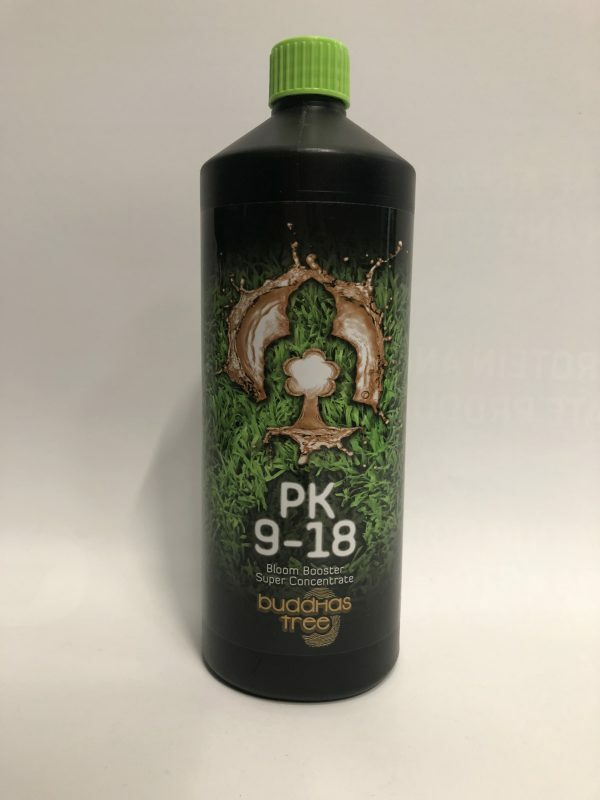 Buddhas Tree PK 9-18 increases plant uptake of nutrient and the plants natural oils and sugars making the plant grow to its full potential, meaning heavier yields and more intensely potent crops. 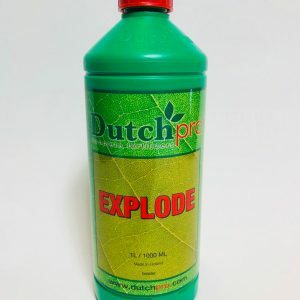 It achieves this by breaking down enzymes in the roots of the plant which creates healthier roots. This soluble solution also encourages more uptake of phosphorous and potassium which is great for your plants health and growth. Local customers who have had the pleasure of using this product have been amazed at the quality of their flowers, their only complaint was the massive increase in their plants natural odours, due to much stronger crops. But a strong scent is the sign of a healthy plant. The importance of Phosphorus(P) and Potassium (K) to any flowering and fruiting plant or crop has long been established by growers, farmers, biochemists and horticulturalists worldwide and is deeply understood. The virtues of PK enrichment during a plants blooming phase have also long been accepted and used in order to achieve maximum yield and quality from desirable crops and favourite cultivars. Many decades of research, backed up by evidence, have shown that the best elemental ratio of P and K enrichment to maximise fruit and flower production, as well as quality, in the majority of our most precious fruit and flower species is one of 9-18. The magic number. However, producing a high performance and safe PK 9-18 bloom boosting supplement that is suitable for use hydroponically and also conventionally in substrates, poses very difficult biochemical challenges that need to be overcome. Through pure biochemical innovation, and an exhaustive focus on the highest standards of performance and safety, Buddhas tree are proud to have achieved new heights in the creation of an EU regulated, organically based PK 9-18 formula of outstanding quality and performance. It is the first truly soluble booster of its kind that is suitable for use with all growing media and soilless techniques. We consider it to be the pinnacle of bloom enhancing nutrient additives. Blending Phosphorus and Potassium correctly and safely, in a form that excels when used in hydroponic and soilless techniques, all under strict EU regulation, is a difficult challenge. Yet one that Buddhas Tree have achieved through pure biochemical innovation and hard work. When creating a PK supplement with the elemental ratio of 9-18, that is also soluble enough for hydroponic growing, the first problem encountered is the serious effect it has on the Ph value of any given solution. This is a big issue where Ph sensitive species of plants are concerned. During the process of blending, this can be counteracted in 2 ways. Firstly by adding chemically derived, and in our opinion sometimes questionable, ingredients to bring the Ph to within a `usable` range (Never a consideration for us). Or secondly, by adding organically based compounds to achieve the same control. Although organically based ingredients are desirable from a safety aspect, the problem with them is that it is difficult to achieve the exceptional level of solubility needed for hydroponics, when using them to control and stabilise Ph. This is where Buddhas Tree PK 9-18 comes to the fore, with pure biochemical innovation at its heart. Our world leading biochemist identified several organically based ingredients some of which are specifically and uniquely refined for our bloom booster. Not only do these ingredients ensure stability of Ph, but they make it completely soluble for hydroponic use, free from synthetics and safe under EU regulation for food grade fertiliser. The important thing about PK enrichment is that it must be available to the plant at an elemental ratio of 9-18. This means by the weight, and NOT by volume of any given solution. Other PK bloom boosters available often have ratios calculated by volume and not weight. This can be misleading as once the actual elemental ratio is calculated it is often way outside the optimum range of availability possible, and needed, for your plants to achieve their potential. By working with our world leading biochemist, Buddhas Tree have innovated the first truly soluble and advanced PK supplement that is suitable for use in conventional soil and coco applications but also essentially, hydroponics. Most importantly its composition is one that has a true elemental 9-18 ratio of P and K calculated by weight, not by volume. Buddhas Tree has been proven to consistently out perform other bloom boosting products available on the market. When using Buddhas Tree PK a minimum of 40% extra yield is the norm when compared to using base flowering nutrients alone. Our innovative blend is created using the highest quality, tirelessly sourced elements, alongside some ingenious natural ingredients that are specially and uniquely refined for Buddhas Tree PK 9-18. It is completely soluble and of an organically based form that is effortlessly absorbed by the roots and tissues of your favourite cultivars. 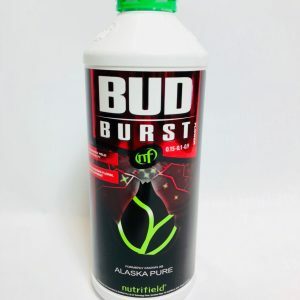 It easily delivers the perfect type, and magic 9-18 ratio, of phosphorus and potassium compounds to your flowering plants, stimulating them and increasing their uptake of these essential elements. This ensures the maximum possible absorption potential is reached during the crucial time of their flowering cycle. 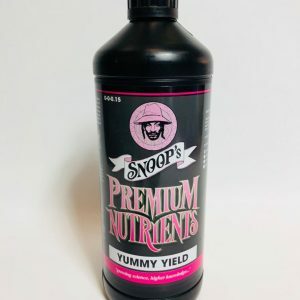 Combining these elements, together with a cutting edge blending process, results in a powerful formula that gives explosive fruit formation and jaw dropping density to your crop, along with massively increased essential oil, terpene and resin production. This produces strong increases in potency and aroma, along with added taste qualities lent to the fruits and flowers due to the sheer volume of natural sugars produced.